Moosaa Richardson continues his reading of Shaykh Saalih al-Fowzaan's explanation of Hadeeth #1 on the topic of: Six Basic Rights of Islamic Brotherhood. 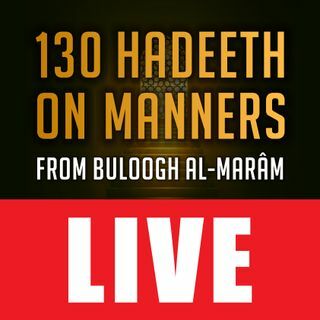 This is the second class of a new series in explanation of the last six chapters on manners from the classic book, Buloogh al-Maraam, by al-Haafith Ibn Hajar (may Allaah have Mercy on him). The explanation of Shaykh Saalih al-Fowzaan (may Allaah preserve him), Et-haaf al-Keraam, is read word-for-word, in Arabic, and translated into clear ... See More English. As salaamu 'alaykum warahmatullahi wabarakatuh.. My ques. is what if I sneeze and other person doesn't say "yarhamukallāh" Should I remind about this hadeeth ? Please address Ustadh @1MMeducation with your questions on Twitter, or by email: MR@bakkah.net (include a 3rd party in the CC if you are female). is there a way for those of us following online to pose a question?